Being a Toronto native, sometimes anime features make their way to the big screen in town. On May 19th, this very thing happened, as I attented the Toronto premiere of "X". Most manga and anime fans out there have heard of the siren team of artists and creative minds known as CLAMP. 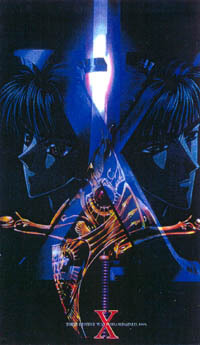 "X" is one of their most popular creations, and was the subject of a movie back in 1996 in Japan. Manga Entertainment picked up the rights to the movie for North American distribution and decided to show this film in arthouses around the continent. "...The story takes place in 1999 - The Year of Destiny - where it's up to one young man to decide the fate of humanity. Will it be victory for the Dragons of Earth or the Dragons of Heaven?..." That basically sums up the events of this movie, which are a very condensed version of the original manga. Popularity sprung the creation of this film 4 years ago, and an "X" TV series has begun in Japan this year. To the actual presentation of the movie...Manga did a solid job with the dub job on this film. None of the voices really make you twitch in disgust every time you hear them, which is probably the best thing you can ask from most dubs these days. There were a few technical issues that needed to be ironed out though. A couple of instances in the film where Japanese subtitles should have been translated and were not. Also, Manga mispelled the character's name of "Kotori" as "Kotari", in the end credits, thereby nulling the translation of her name as "small bird". Hopefully, these glaring errors will be fixed for the VHS and DVD versions of the film. The audience at the premiere was ghastly, laughing and hollering at the end of the film, because they found the last shot amusing (if you've seen the film, you probably know what I'm talking about and also share my surprise at the show of immaturity). That aside, it was an enjoyable watch, and if "X" is showing at a theatre in your city, I recommend you check it out, even if you've already seen the original. Aside from a minor few errors, the film is an enjoyable watch that shouldn't be missed.